The 2019 Product Brochure is here! What a start to 2019 – our new brochure is on it’s way to you all and we’ve had a busy few weeks already. It’s set to be a really exciting year here at Lomond – with our Taste 2019 trade show in May and various on-trend product launches happening soon. We’re looking forward to a fantastic year. The first big news of 2019 is the arrival of our new brochure. It should be on it’s way to you now, but before it arrives, we wanted to share some sneak peeks with you and let you know about some of the features you’ll find inside. On pages 6 – 7 you’ll find a feature on our new, all-in-one food-to-go solution – Nom Stop. 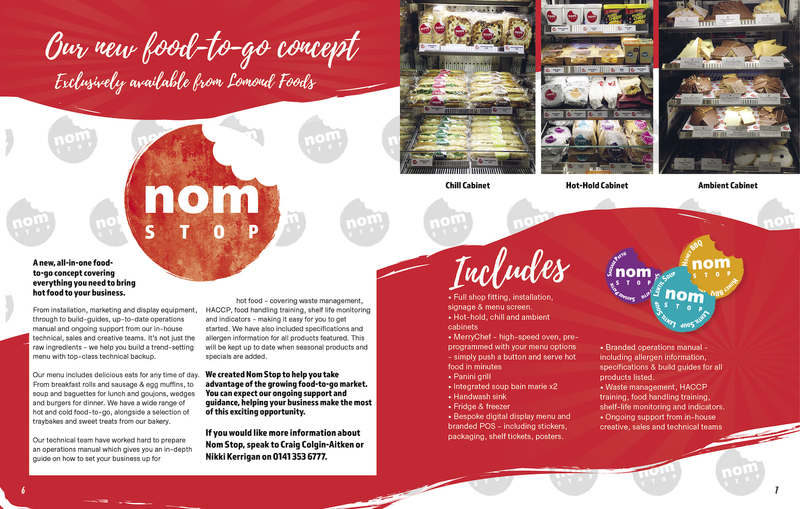 Pages 6-7 of our 2019 brochure, showing Nom Stop information. We’ve done things a bit differently and made things a lot easier for you – we take care of everything from initial surveys, installation and equipment to product build guides, menu display and the food you sell. As well as a fridge, freezer and hot hold, ambient & chill cabinets, we also supply you with a panini grill, bain-marie for soup and a Merrychef high-speed oven – allowing you to heat and serve a wide range of products. All of these options mean that you can serve a wide range of products, keeping your customers happy and coming back for more. We provide ongoing support from our sales, technical and creative teams, meaning you can focus on selling the food while we take care of the rest. We will provide you with branded aprons and greaseproof paper, product imagery and USB menus – bespoke to you and your product range. It can be a minefield trying to navigate the set-up on your own, making sure you have waste management in place, properly training your staff and making sure the products are made to the same standard time and time again – our in-house technical team will train you on food safety, provide you with allergen guides and product builds, taking the hassle out of setting up food-to-go. Our first Nom Stop is launching next Tuesday 22nd January, in Millerston. Keep your eyes on our social media to find out more about our launch offers and see how the first Nom Stop opening has gone. If you would like more information on Nom Stop, please call our team on 0141 353 6777 and speak with Craig or Nikki. We’ll be posting more sneak peeks of our brochure over the coming days. Your brochure should be in the post, but you can request a copy from your rep or by calling 0141 353 6777 and speaking to our telesales team.